Analog Way has released the new v03.01.60 firmware update for all the LiveCore Presentation Mixers. The new firmware offers major improvements in terms of show creation and management. 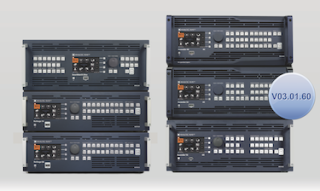 Analog Way LiveCore T Series.Analog Way’s LiveCore series of AV Mixers offers versatile connectivity and processing through six models: Ascender 48, Ascender 32, Ascender 16, SmartMatriX Ultra, NeXtage 16, and NeXtage 08. The line has been updated with new v03.01.60 firmware, immediately available for all the LiveCore systems. The new firmware offers major improvements including the new Cut & Fill feature. This functionality allows the content of a layer to be keyed using an input or a still picture (frame or logo). Pairing two layers with the Web RCS—one containing a gray level source (Cut), the other one a live source (Fill)—the unit can display perfectly keyed content to achieve non-rectangular, smooth-edged key layers. The Cut can be either a live source synchronized with the Fill or a still picture. In addition, several other features that expand display capabilities have been implemented. Operators can now create custom output formats. These can be stored in the Custom Output Format section, which offers up to 10 memories. This feature is particularly useful for LED wall applications and nonstandard industrial display applications. Thanks to the new version firmware upgrade, the LiveCore systems now enable to import or capture 4K frames, and the Dual-Link DVI output plugs support the output formats 3840-by-1080 and 4096-by-1080 (up to 60 Hz). For devices with four outputs, these formats can be used to create 4K screens with Top-Bottom output configuration.